POTTERS BAR, United Kingdom – HARMAN’s Studer is proud to announce that its Broadcast Academy training course for Studer consoles is now available online at StuderBroadcastAcademy.com. The popular and informative training program has been previously held in the United States on the Soundcraft Studer mobile audio truck, which has visited numerous locations of Studer regional sale rep firms and flagship Studer customers in recent years. StuderBroadcastAcademy.com has been developed in partnership with the Conservatory of Recording Arts and Sciences (CRAS), one of the world’s premier audio recording, sound engineering and music production schools. In addition, many of the broadcast industry’s leading sound engineers provided input and guidance in the development of StuderBroadcastAcademy.com. Once they have completed the course, engineers have access to all the teaching materials as often as they need, to refresh their knowledge and to use as an on-the-job aid when working on a Vista console. 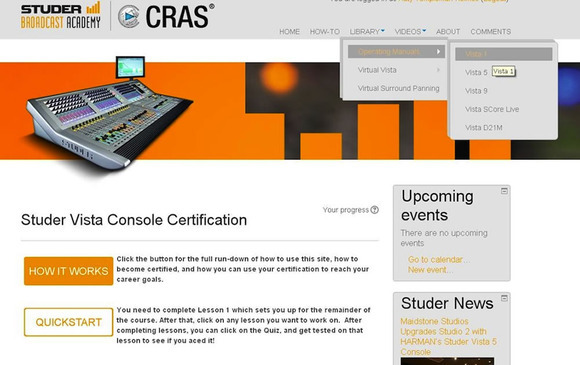 Certified Vista Operators are also welcome to attend subsequent hands-on training sessions (locations will be announced on StuderBroadcastAcademy.com) to further their skills. In addition, certified operators can opt to be listed on the Studer website in a searchable database that sound contractors and industry pros will be able to access.